But Dorie’s Chocolate Pudding is so unbelievably, phenomenally, breathtakingly fabulous (I’ve run out of words!) that it’s in a class by itself. I made it almost as written, except that I substituted one cup of half-and-half and one cup of skim milk for the two cups of whole milk, because that’s what I had. I’m going to try it again with all skim to see what happens — I bet it will still be amazing. There were a lot of steps — this recipe is certainly considerably more complex than my old standby. It’s not something I’d want to dash off in a hurry. I measured all the ingredients out first — I often measure out some, but it’s rare that I’ll have everything done in advance — and enlisted #2 Son to melt the chocolate while I got started on the other steps. Combine cocoa powder, cornstarch, salt, and milk in a medium saucepan. Stir to combine well and then cook over medium heat, stirring constantly, till pudding starts to thicken, then remove from heat. (Just when to take it off the heat is a matter of preference, and the only way to figure out how you like it is to experiment. It will thicken more as it cools.) Stir in vanilla. Pour into a one-quart casserole dish or four small ramekins; top with parchment paper to avoid a skin if you’d like. 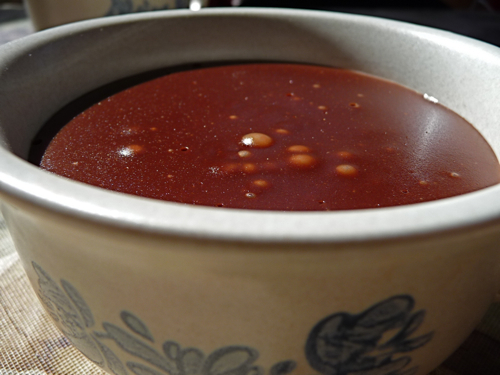 This pudding is awesome warm, room temperature, or cold, so eat as you see fit. This entry was posted Tuesday, July 15th, 2008 at 8:00 am	and is filed under baking, Dorie. You can leave a response, or trackback from your own site. Dorie’s pudding really is in a class by itself. I hadn’t craved pudding in forever, and now … I’m ruined for it! We thought the pudding was great, too. Nothing like the boxed kind. Dorie’s pudding was a huge hit in my house, rich and delicious! Looks really good. We loved it here too! Mmm, it looks so yummy in that last photo. Almost like chocolate soup. Lovely pudding and thanks for the lower fat-recipe! I love your “mise-en-place” picture. It looks glorious. Can’t wait to see your simpler and lower fat version though. I don’t want to *live* on the elliptical trainer. What a beautiful pudding and the mise en place looks so very organized! Thank you for the tip about the spatula – will try for next time. it looks awesome. i love the ingredients picture. this pudding was definitely one of my favorite picks so far. 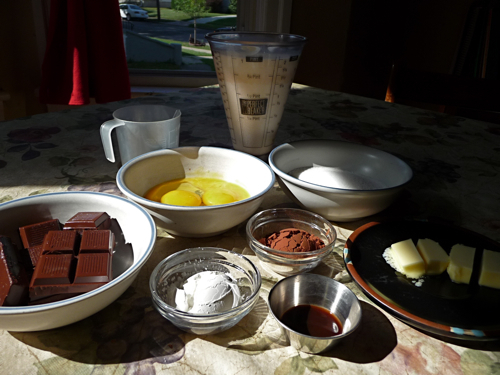 I love that photo of your ingredients with the sunlight shining! Gorgeous pic! It needs to be in a magazine! And I want to swim in your pudding!! !